Is it end of recession in IT sector ? (So-called) Recession is going on since last year or longer. But there are clear sign of end of recession in atleast in Information Technology sector in India. – Recent results of Tech giant Infosys ,which even pushed stock price of TCS alot. – IPO of Infinite over subscriced 43x times & 11x times in Retail category, surely suggests investors confidences back in IT bussiness. – Ascent, job advertisement supplement of ToI is full again with IT jobs. At-least picture looks bright in media, god knows what is holding inside. Posted byvirals January 14, 2010 Posted inUpdate3 Comments on Is it end of recession in IT sector ? Recently, I purchased Seagate FreeAgent Go Portable Drive. I have Fedora 12 Linux on my system & it turned out to be mess with partition table. I went ahead & formatted & found it working well atleast with Ext4 file system :). Similar to Last year, This year also I went to Jayanagar Syunkt mandal organized function, my friends and me did all above stuff :). Everyyear, it is held at BES college in Jayanagar. This time, I did better garba, rass than last year and obviously enjoyed more. To add more, as always, last night, we had unlimited Fafda Jalebi 🙂 All and all, to enjoy garba in Bangalore, Jayanagar and Palace ground are best palace. Obviously, during navrati, I did meet more new gujarati people in Bangalore and had nice time with them. I use Linux on my laptop, so was feeling bit different when I recently used Windows and Mac on few friends laptop. I want to do some browsing and media playback. On both machines, Mac as well as on Windows, I end up using Firefox for browsing and VLC for media playback. On windows, Internet Explorer and Windows Media Player was existing while on Mac Safari and QuickTime. But on both machine, default was Firefox and VLC. That made me to think about this topic of Free and Open Source software on Proprietary Operating System. I asked my friends about usage and experience with Firefox and VLC, which was positive. In one line, Both of them rocks ! ! ! So those who likes to use Firefox and VLC, take one step forward and try some linux operating system (any distribution ubuntu, fedora, centos etc.) And make a change in your life. Those who still wants to stick with Windows and Mac, Please ask your operating system providers to offer better software. Obviously FOSS developer does not mind you providing support if asked in proper way, although many times people ask and expect different level of support and make developer frustrated. Otherwise as I mentioned, Best use of Internet Explorer is to visit mozilla.com and download Firefox. Last weekend, We had Barcamp Bangalore 8 at Yahoo! Campus. I met lot of people during the event and most them were from different background. Students, working professionals from start-ups as well as big companies, freelancers and few entrepreneurs too. One of the session was Open Source Licencing model which discussed few of various licence. We had good discussion on few framework for web-site and on Twitter and Facebook. I had good discussion with Prakaz over life as freelancer. Parkaz had left his day job and started working as freelancer, he is good photographer too. To conclude, I had nice discussions at BCB8 and I felt, I did take back somethings with me. Dhempe had taken few video clips during BCB8 and have uploaded here. This year Navratri dated during September 30 to October 8, 2008. We also had couple of leaves owing to Eid (October 1) and Gandhi Jayanti (October 2). Thus, we end-up having lot of garba and dandiya. I had gone with my room-mate and few friends. We went to Jayanagar Sayunkt Mandal’s Garba for 3 nights. The venue was BES Law College ground. Typical, it starts at 10 pm with first aarti followed by slow garba. Garba picks speed over a half an hour. 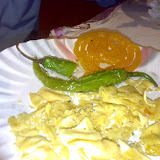 Besides Garba, we had Raas and Sanedo. Raas is traditions dandiya-raas, mostly as shown in plenty of hindi films. Sanedo is centuries old traditional Gujarati folk song type. During sanedo, basically we sing couples of song, covering topics like general critics, current social issues and players follow his tune. BeagleBoard : Beagleboard is Open Source project (both in-terms of hardware and software.) Beagle is low power OMAP3530 based platform and provideis high performance at low-cost. At barcamp, Khasim demonstrated Angstrom Linux running on Beagleboard and played Big Buck Bunny movie. One can execute GIMP and Firefox 3 on Angstrom running on Beagle. Firefox Indic Localization : Firefox has various Indian Language variations. There are quite a few volunteers in India contributing to Indian Language port of Firefox. One of them had came to Barcamp and explained how one can involved in Indic Localization. CallGraph : Skype call recorder. CallGraph.in demonstrated plug-in for Skype, using which you can record call. Some of the feature of Callgraph is one can directly upload recored call conversions to mail account or web-account. One can also share stored call using widget. Muziboo Online Recorer : Muziboo demonstrated new feature of their web-site, Online recording. Muziboo now provides facility to online record, thus Singer does not have to recored on his computer and manually upload song to their account. Session on Python 3 and Wikipedia gave a good inside on both of them. An interactive session on E-Learning had lot of discussion and interesting ideas. Other non-techi interesting sessions were on Cycling and Paragliding, both sessions excited me. I seen verity of cycles together (as many as 12+ different models). I got opportunity to take a round of IIM on one of available cycle too. I also had good amount of chat with Yusuf Motiwala of Tring Me, ranging from linux, multimedia, Gujarat and many more things. 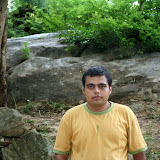 Along with my office-mates, I visited Bannerghatta National Park on June 7th, ’08. It is located in out-skirts of Bangalore (around 20 km from centre towards South). My company had hired a big cab and we reached with-in one hour at BNP. BNP has good amount of tigers and lions, including white tigers.